If you are of the belief that Show Boat can stand on its own as a classic score and thus doesn’t need the trappings of musical production, you’ll love the New York Philharmonic’s “semi-staged” production. Conductor/director Ted Sperling presents the Jerome Kern/Oscar Hammerstein classic as almost entirely a concert opera. Only a thin backdrop of an old-fashioned river-boat set the scene. The singers and dancers were dressed in modern evening wear, and the action is limited to the thin apron of the Avery Fisher Hall stage. Sperling uses the entire Philharmonic, instead of the usual pared-down orchestra that’s typical for these musical presentations. The musical choices Sperling made were almost entirely sound. He’s reinstated many of the often-cut songs, including songs that didn’t even make it to the 1927 premiere (“Mis’ry’s Comin’ Around” and “It’s Getting Hotter in the North”). He’s pared the dialogue down considerably, but thankfully hasn’t scrubbed the libretto of its “period” dialect, that, yes, includes that racial slur. And he’s even kept one of the most cringeworthy scenes from the musical, the second act World’s Fair scene, where a gaggle of white folks are having fun staring at “exotic African warriors.” Show Boat includes such beautiful scenes of racial harmony (including the always heart-warming scene of Julie and Queenie teaching Magnolia how to sing) that it’s good to also keep the less feel-good stuff. His use of the full Philharmonic and chorus gave Kern’s score a richness of sound that’s often absent in Broadway musicals. 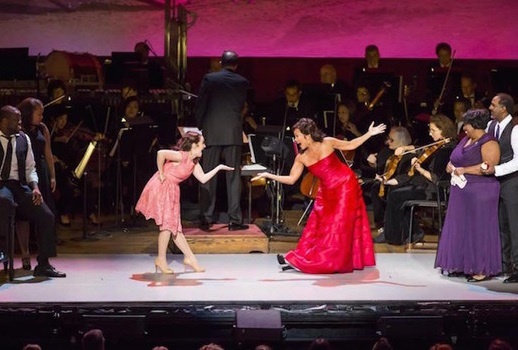 Miking was less obtrusive than it usually is—the voices and orchestra balanced together to create a musical fabric that would be missing if Sterling had pared down the orchestra. Sperling’s casting choices were mostly sound as well. He’s made the decision NOT to double the Kim/Magnolia role, so a more modern, flapper Kim (Erika Henningsen) can sing a rather brassy production number (“It’s Getting Hotter in the North”) while Magnolia can keep her romantic, sweet style of singing that Kern took so much effort to convey. Lauren Worsham (Magnolia) and Julian Ovenden (Gaylord) sounded enchanting. Both have soaring voices and did “Make Believe” and “You are Love” justice. Ovendon in particular has a handsome tenor voice and really nails the part of Gaylord down pat—he’s of course one of those useless charmers, but with Ovendon singing, you believed more in the charm than the uselessness. NaTasha Yvette Williams (Queenie) had a deep, rich, soulful voice that lent gravitas to this rather thinly written role, and Alli Mauzey (Ellie) and Christopher Fitzgerald (Frank) were very charming as the comic duo. “I Might Fall Back On You” was a highlight. It’s depressing then that with so many fine attributes, the parts of this production that fell flat really fell so flat. For one, Norm Lewis (Joe) doesn’t have the richness and power to do justice to the show’s anthem “Ol’ Man River.” And if you’re cast as Joe, pretty much your entire job is to sing “Ol’ Man River.” He sounded like a salon baritone filling in for Paul Robeson. I really hate this sort of casting—just because an artist is African-American and labels himself a “bass” doesn’t mean he should be cast for the part. It’s puzzling that Sperling’s careful musical choices would result in such a misfire. Cap’n Andy and Parthy Ann Hawks are mostly just acting roles with minimal required singing, and so it was dismaying that Fred Willard didn’t really act much and Jane Alexander wasn’t very funny as the shrewish Parthy. Other choices were simply wrong-headed. Lauren Worsham is definitely a young, ingenue-type Magnolia, and barely makes an effort to act/look/sound more mature in the second act when Magnolia’s supposed to be middle-aged. That’s really okay—of the Magnolia’s I’ve seen, only Irene Dunne in the 1936 movie was believable as both young and mature Magnolia. With that being said, there’s no excuse dressing Magnolia for most of the evening in a short, juvenile dress one might find on the Forever21 sales rack. Worsham’s voice is beautiful but her portrayal had an immaturity and archness at times, and the tween presentation didn’t help. The other major misfire was the half-hearted dancing. The choreography by Randy Skinner didn’t look well-rehearsed, and to be fair, the players were confined to such a tiny portion of the stage that I’m not sure Fred Astaire could have danced well under the circumstances. But so many of Show Boat’s numbers practically dance off the page that to see it accompanied by “dancing” that belongs in a basement church social took the steam off those production numbers. But you can’t kill this musical. It’s considered the first great American musical, but as the years pass, I’m of the opinion that it’s the greatest American musical, period. No American musical matches Show Boat in richness, beauty, and depth. You can’t kill the score, and despite some very dated dialogue and plot points, you can’t kill the story either. There are so many moments that register so powerfully, all these years later, that one wonders why no one writes music like this anymore. It would get very boring if I were to list all the moments of Show Boat that brought a tear to my eye, so I’ll just list one. In the second act Magnolia has been abandoned by her husband and is in dire straits. She makes a desperate audition at a seedy club and sings “Can’t Help Lovin’ Dat Man of Mine.” The club owner is unimpressed, but Magnolia is defiant. “That’s the most beautiful song in the world,” she says. Magnolia is of course paying homage to Julie, who was cast off the ship with her husband Steve when it was revealed that Julie and Steve were an interracial couple. It was Julie who taught Magnolia how to sing. The idea that in the segregated, Jim Crow South, music became the universal language that bonded people of all races together is the real theme of Show Boat, and that’s why in 2014, the musical just keeps rolling along, enchanting audiences every time it plays.